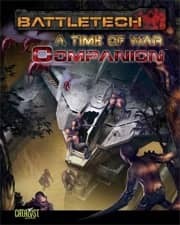 The A Time of War Companion is an advanced rules expansion for A Time of War: The BattleTech RPG. It offers several rules expansions designed specifically to enhance the basic game play experience of A Time of War campaigns, while retaining compatibility with the rest of the core rules line. Launch yourself into the universe of BattleTech with new technologies and prove your heroism to House Lords and Khans alike! Visit strange and distant worlds, and battle alien beasts beyond your wildest dreams! Demonstrate new combat techniques both in and out of the cockpit, while navigating the intricate layers of neo-feudal politics! Whether your are a House regular, a pirate smuggler, a noble scion, a deep space explorer, or just a thrill-seeking adventurer, bring your experience to a whole new level!